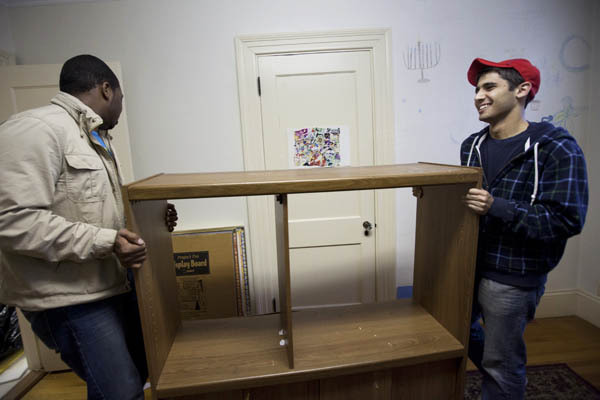 This October 2010 image shows Mikey Pasek ’12, at right, with Jourdan Fanning ’13 moving furniture in the Office of Intercultural Education, a location that includes space for Bates Hillel. Photograph by Phyllis Graber Jensen/Bates College. Soggy rice in Commons, issues with general education requirements or unjust national energy policies — many of us are content to complain about the issues that irk us on a daily basis. Not Mikey Pasek ’12, senior class co-president. It isn’t Pasek’s style to grumble while waiting around for improvement. Instead he feels duty-bound to take action and make change happen. A native of Ardmore, Pa., Pasek has served as class co-president since his junior year, and is a student government representative to both the President’s and Dean’s advisory committees. He was one of four students taking part in the committee that revised the college’s mission statement in 2010. In all these positions, Pasek challenges the apathy that he sometimes recognizes among peers and sees as symptomatic of larger cultural tendencies. Pasek finds that one of the most effective means of championing issues is to make specific in-person appeals — one-on-ones with peers or campus officials. Creating personal connections, highlighting individual potential and establishing a narrative other people can feel positive about, quite simply, all get results. Pasek is just as straightforward with his opinions of the world beyond Bates. He has contributed several opinion pieces to various publications in the last four years, including articles in Lewiston’s Sun Journal and Jewish Exponent, a Philadelphia-based weekly newspaper. Pasek also helped co-found Bates’ J-Street U, a chapter of the national student activist organization promoting peace, security and social justice for Israel and Palestine. He serves as vice-president for the local chapter and is the national organization’s co-chair for New England. The Bates chapter is highly regarded by the national organization. With Pasek and President Alex Friedman ’12 at the helm, the chapter collected 500 student and staff signatures that persuaded Maine’s U.S Rep. Michael Michaud to sign the so-called Price-Welch letter encouraging continued U.S-Palestinian aid. Pasek’s interest in the Israeli-Palestinian conflict shapes his academic experience as well. He is currently gearing up to defend a yearlong honors thesis on American Jewish perception of Israel for his self-designed political psychology major. Recognizing that not all Bates students share his ease in leadership roles, Pasek has also helped facilitate Bates communities of interest that he is not as personally tied to. Co-president of Hillel, Pasek does not identify as particularly religious, but is aware that Hillel serves an important role on campus creating a space for a group sometimes underrepresented on campus.